That’s the only word to describe the 2011 Yu-Gi-Oh! TCG Collectible Tins. 3 more Super Rare variants of out-of-print cards. If you tried to get the contents of this tin separately, it would take you a lot of time and work. But to help celebrate the holiday season, and their upcoming 10th Anniversary, you can get it all in one place at a bargain price! 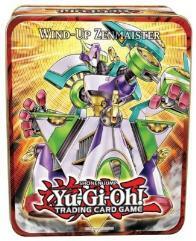 The Wind-Up Zenmaister Collectible Tin features one of the first black-framed Xyz Monsters. This clockwork commander requires just 2 Level 4 monsters to Xyz Summon. Once on the field, you can use its Xyz Materials to flip your monsters face-down, then face-up again. This is a great way to get multiple shots out of your Flip Effect Monsters, or to re-use the effects of your Wind-Up monsters from Generation Force and other booster pack sets, or to get rid of any nasty effects your opponent has put on your monsters. Like the Number 17: Leviathan Dragon Collectible Tin, this tin also includes Pot of Duality, one of the most popular cards from the last year. Both tins also include 3 more Super Rare variant cards (different cards in each Tin). Whether you’re picking this up for yourself or shopping for a Duelist you know, this is a money-saving opportunity that you literally cannot afford to miss.